This week’s Dubai Airshow was the first time that a UAE Air Tractor AT-802i has been shown in public. The UAE purchased 24 of these highly modified agricultural aircraft, and took delivery of the first in late 2010. Media reports suggest that six of the aircraft are being donated to Jordan but probably with armament capability removed. Intended for counter-insurgency and border-patrol duties, the UAE’s two-seat Air Tractors were provided by U.S. company Iomax, which undertook the mission system integration. 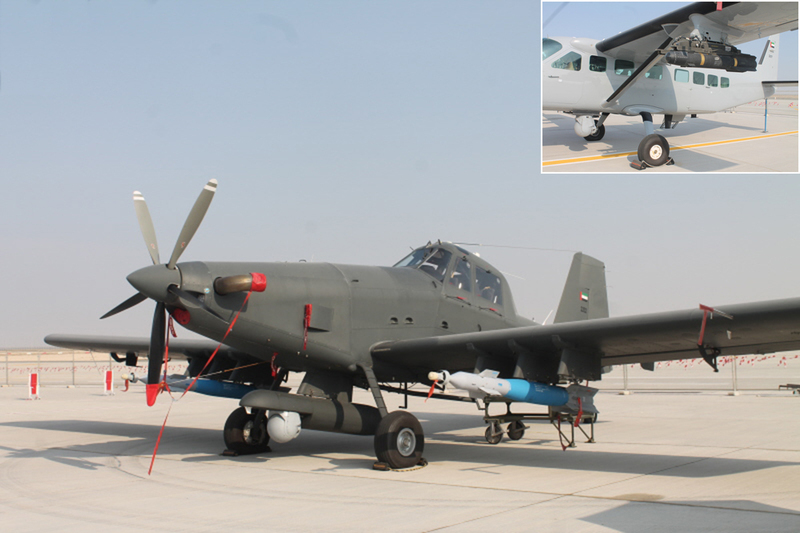 Unlike Air Tractor’s own AT-802U demonstrator, the Iomax AT-802i has been supplied to the UAE in two batches (Blocks 1 and 2) with minor differences. The U.S.-based company has since taken the mission system from the Air Tractor AT-802 and installed it in the outwardly similar Thrush 510P, and in this Block 3 configuration launched the aircraft as the ArchAngel at this year’s Paris Air Show. Any future deliveries would most likely be of the Thrush version, which has also switched to an L-3 Wescam MX-15 as the preferred sensor ball option. The aircraft on show at Dubai was displayed with GBU-12 laser-guided bombs on two of its six underwing hardpoints, and a Flir Systems EO/IR/laser designator turret mounted on an external carrier. The latter is Iomax’s flexible pod system, which not only mounts the sensor ball in a low position to minimize obstruction by the propeller and undercarriage but also incorporates datalinks for downlinking imagery, self-contained GPS and interfaces with the aircraft’s mission system. The pod can also be fitted with defensive countermeasures as an option. An important weapon intended for the AT-802i is the Roketsan Cirit laser-guided rocket. Cirit is an all-new 2.75-inch precision weapon, as opposed to an upgrade of existing unguided rockets. Turkey has ordered the rocket for its T-129 Atak attack helicopter; the UAE also ordered the rocket. The first firings from a fixed-wing aircraft were made in January from an AT-802i at a “Middle East” range, almost certainly in the UAE. Also making its public debut alongside the Air Tractor was a Cessna AC-208 Combat Caravan. This aircraft is fitted with wing pylons for up to four Hellfire missiles and a Flir Systems sensor turret. It is not clear which company performed the arming, although North American Surveillance Systems, which has performed other Caravan conversions for ISR duties, provided at least some of the specialist systems for the UAE’s aircraft. Both types are assigned to Aviation Group 18 of the UAE’s Special Operations Command. Air Tractors and Caravans operate from the 3,400-foot runway at Falaj Hazzaa camp, located within the city of Al Ain near the Omani border east of Abu Dhabi. The Caravans were previously noted at the Special Operations Command base on Sas Al Nakhi island near Abu Dhabi city, which has a 6,500-foot runway. Sas Al Nakhi is the main base for Group 18’s assorted helicopter fleet, which includes CH-47 Chinooks, UH-60 Black Hawks and AS550 Fennecs, among others. Examples of these were also on show at the Dubai Airshow. Although unconfirmed, the operating unit of the fixed-wing aircraft is thought to be 22 Squadron, which also flies the DHC-6 Twin Otter. Other Group 18 units include those numbered 23 (Fennec), 25 (Chinook) and 26 (Black Hawk).